The Birmingham Centre for Railway Research and Education is a muti-disciplinary centre spanning the Schools of Civil engineering, Electrical, electronic and computer engineering and Materials and Metallurgy. One aspect of the Centre’s work involves the use of purpose built accommodation at the RTC Business Park to carry out vital research into the aerodynamics of high speed trains. The team operates a large test rig at the site to simulate the aerodynamic effects experienced by vehicles travelling at high speeds. This enables crucial investigations into the effects of wind on the safety and reliability of the trains, as well as the impact caused by their slipstreams on infrastructure. 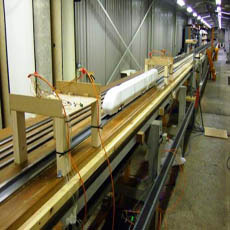 The overall length of the facility is 150m with a 50m long test section, and the model is at 1/25th scale. Propulsion is by means of one of two catapults, one at each end of the rig, which allow a model speed of up to 75 metres per second. For more information on The Birmingham Centre for Railway Research and Education, click here.